The Department of Labor is in crisis. Its top leadership throughout the Bush Administration was notably weak. It has been starved of resources for decades. It has operated as if enforcement could operate in a vacuum. Its internal divisions have been chopped up and operated in silos. Not surprisingly, its career staff is demoralized. The Department of Labor leadership must bring vision, passion and creativity to the agency’s mission. It must also bring a concrete program for rebuilding the Department of Labor focused around core priorities, one of which must be stopping wage theft. Seventy years ago, the President and the Secretary of Labor set forth a vision and a comprehensive program for the Department of Labor that drove the agency’s work for decades. The vision of the Department of Labor, “to foster, promote, and develop the welfare of the wage earners of the United States, to improve their working conditions, and to advance their opportunities for profitable employment,” remains strong. The programs and capacity must be strengthened and enhanced. This article proposes priorities for rebuilding the Department of Labor’ effectiveness in stopping wage theft and reclaiming the mission of promoting the welfare of wage earners. The changes will enable the agency to protect and defend the nation’s workers and employers. The proposals begin with small, relatively modest changes that can be implemented immediately and then progress to more significant ones, which will require political leadership. Given the economic challenges facing the federal government, anything requiring additional resources, which are absolutely essential for rebuilding the Department of Labor’s capacity to deter wage theft, will demand strong political leadership. Additionally, strong political leadership will be necessary to engage the nation in conversations about what are the standards we collectively wish to set for workplaces in the 21st Century. New leadership at the Department of Labor should operate on multiple levels simultaneously. The “easy” changes should be implemented immediately. The more complicated ones should be started immediately with clear time-lines for implementation. The broader ones should be discussed internally within the agency and with Congressional allies to clarify the most effective approaches for engaging the nation in raising the standards. Allow the Wage and Hour Administrator to report directly to the Secretary of Labor. Wage and Hour is the division most focused on stopping wage theft. The Wage and Hour Administrator reports to the Employment Standards Assistant Secretary who then reports to the Secretary of Labor. Allowing direct reporting would give this work higher visibility and direct access to the Secretary of Labor. It would also make the Wage and Hour Administrator and the OSHA Administrator peers, thus making it easier to jointly collaborate. The Wage and Hour Division should also have its own budget, so it can clearly advocate the resources needed to stop wage theft. Because the Employment Standards Administration was initially created by Department of Labor and not by Congress, it can be changed with a memo from the Secretary of Labor. Assign the Women’s Bureau and the Faith Based Office to the Wage and Hour Division. The Women’s Bureau’s mission is to improve the status of wage-earning women, improve their working conditions, increase their efficiency, and advance their opportunities for profitable employment. The Center for Faith-Based and Community Initiatives (CFBCI) at the U.S. Department of Labor mission is to empower faith-based and community organizations (FBCO) as these organizations help their neighbors enter, succeed and thrive in the workforce. [Note 1]1 These divisions have played significant leadership roles over the years in focusing the agency’s work on key constituencies. Given the crisis in wage theft, these agencies should be assigned at least temporarily to focus on engaging women’s organizations and religious organizations in fighting wage theft. These divisions could provide enormous energy and creativity in helping reach out and broaden the effectiveness of the agency’s efforts to stop wage theft. Publicize the department’s commitment to wage enforcement regardless of immigration status. The Department of Labor and the Immigration and Naturalization Service (which was renamed Immigration and Customs Enforcement) made a formal agreement in 1998 to keep a wall of separation between the agencies so that workers who complained about workplace problems would not be deported. The DOL staff is very clear that the agency enforces most labor laws regardless of workers’ immigration status, but workers don’t know that. Given the upswing in workplace raids and the anti-immigrant bills being introduced or passed in many communities, most undocumented immigrants workers won’t file complaints for fear of being “turned in” to the Immigration and Customs Enforcement Agency (ICE). The agency could combat this fear and encourage workers to file complaints against wage robbers by publicizing widely its policies on its posters, outreach materials and website. DOL staff members should reemphasize this policy every time a public presentation is given. It is common practice in community policing initiatives, for enforcement agencies to provide funding for community partnerships. When the Department of Justice sought community involvement in anti-trafficking initiatives, it funded 42 local partnership initiatives. This small, but important, pilot program proposal could help the agency develop the capacity to collaborate more effectively with community organizations. The pilot should be measured, evaluated and expanded if found effective. Expand and strengthen partnerships with legal clinics. In addition to the workers centers around the country, there are a handful of law school- and community-sponsored legal clinics that focus on worker issues. The clinics should become full partners with the Department of Labor. Wage and Hour Division staff should help train the clinic staff and volunteers and should streamline reporting procedures between the clinics and the Wage and Hour offices. These legal clinics should be viewed as direct extensions of the Division’s work. Develop strong partnerships with unions. In an effort to appear “fair and balanced,” Wage and Hour staff have historically steered away from partnering with unions. Although there certainly is a need for the Department of Labor not only to focus on employers who happen to be the target of organizing campaigns, this does not mean that are many important ways for unions and the Department of Labor to partner to reach out to workers in industries known for stealing wages from employees. State departments of labor collaborate with unions, so too should the federal Department of Labor. Establish referral protocols between Wage and Hour Division and OSHA. Employers who steal wages from workers are often the same ones who do not adequately protect workers against injuries and illnesses in the workplace. Despite the fact that many workers experience both health and safety problems and wage theft problems, the Department of Labor does not do a good job of addressing all a worker’s problems simultaneously. I sent a Freedom of Information Act (FOIA) request to both the Wage and Hour Division and OSHA asking about how often they refer leads back and forth to one another and how often they jointly investigate employers. The OSHA officer told me she had been with the agency for nine years and had never received such a FOIA request. She had no idea where or how to find the information. The Wage and Hour Division responded that it did not keep track of referrals. [Note 3] I suspect there are far fewer referrals back and forth than there should be given the workers centers’ experience with workers facing both wage and health and safety problems simultaneously. At the minimum, the agency should develop clear protocols for tracking referrals between the Wage and Hour Division and OSHA. Create and promote a “Do-It-Yourself” Kit. It is very difficult for workers, especially those with poor writing skills (this includes the one in five American adults who are functionally illiterate[Note 4]) to challenge their employers. The Alberta Canada wage enforcement agency has a simple “do-it-yourself” kit for assisting workers in informing their employers that they are owed back wages. The Wage and Hour Division could easily create, distribute and post on its website a similar kit for assisting workers in talking directly with their employers about back-wage problems. Workers would be able to copy the basic letter with official sounding language and put in their specific information about hours worked and wages owed. A copy of the relevant law or fact sheet could be attached. The Wage and Hour Division should institute a general policy of questioning workers away from the workplace, especially in situations where there is reason to believe workers might be fearful of retaliation. Workers centers, legal clinics, union halls and congregations could be asked to serve as meeting places where the enforcement staff could meet with workers. Communicate with workers and workers centers about wage theft cases. Once a worker files a complaint or a worker center helps workers file a complaint about wage theft, the worker and the centers often get pushed out of the investigations. Workers complain that investigators won’t return phone calls, don’t discuss potential settlements, and don’t ask for additional information that could strengthen the cases. Part of the lack of communication is simply a workload problem. The investigators have too many cases and can’t be as responsive as they should. But part of the problem is the approach. Workers and workers centers could help investigators build their cases to ensure that back wages are collected and justice is served, but investigators must be transparent about the process, the facts needed to build the case and plans for settlement. Some investigators claim that they must work in isolation for privacy protection reasons. Many state investigators operate in much more collaborative and respectful fashion. They return calls from workers and workers center staff. They meet with workers and share what information is needed to build the case and recover all the back wages. They talk with workers about what the settlement plans are and explain them carefully. This approach of communicating with workers and their advocates at workers centers results in better information for investigators and better results for workers. The Wage and Hour Division should work with its state allies to develop more collaborative guidelines for communicating with workers and their allies. Workers should be able to sign a form allowing a worker center or legal clinic advocate to communicate with the Wage and Hour investigator about his or her case. Engage workers in information gathering. Even though workers may be victims of crimes, they are willing and eager to help in the process of gathering information to make their cases. Unfortunately, many investigators do not tap the willingness of workers to help gather information for their cases. Investigators should figure out how to educate workers about the kind of information needed. Michael Kerr, former Wage and Hour Administrator from December 1999 to January 2001, told me the story of his father Thomas Kerr who represented janitors in an anti-trust case. When attorney Kerr took depositions he did so in an auditorium thinking that people might be more comfortable doing so together. One by one, he began to get statements from the workers up on the stage. As workers listened to the questions he asked, they began to understand the information he needed. The further along the process went, the more useful information he gathered. The workers themselves were forthcoming, and they found other workers who could help with information. There’s no reason why Wage and Hour investigators couldn’t use similar approaches for engaging workers in information gathering. File lawsuits more quickly and require “tolling” agreements more often. If a worker has had wages stolen, usually the Department of Labor will only collect wages for the last two years (in occasional “willful violation” situations the department will go back three years). Let’s say when a worker filed a complaint, she calculated she was owed $4,000 in back wages. If the employer began from that time period forward paying the worker the right amount, the amount owed the worker would decrease based on how long it took the Department of Labor to handle the case. If the employer stalled on responding to requests for information, challenged the investigator’s calculations or dragged out the investigation in another fashion, the case might not get settled for a year. Because the Department of Labor policy has the investigator looking back for two years, the final settlement figure would be two years from when the case was settled, not two years from when the case was filed. Thus if the case took a year to settle, the employer would only owe the worker $2,000 in back wages, not $4,000, because the first year of stealing wages wouldn’t count. Make public examples of egregious violators. 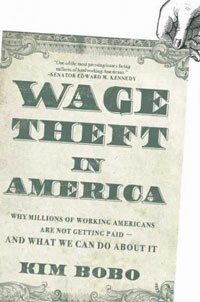 Please review the last chapter [of Wage Theft in America] to see detailed explanations of these remedies. All could be done without new statutes. Get more cops on the job. The Wage and Hour Division has too few investigators to adequately protect workers from wage theft. As was explained in great detail [earlier in Wage Theft in America], the Wage and Hour Division needs to dramatically rebuild its enforcement staffing capacity. The President and Secretary of Labor must request and fight for a substantial budget increase for the Wage and Hour Division. Given the lag time that it will take before a budget is passed and new staff are recruited and trained, the request for higher staffing levels must be made immediately so results in better and expanded enforcement can be seen within a few years. It will be next to impossible to consider other significant improvements in the functioning of the Wage and Hour Division without more staff. Assign or hire more attorneys to file wage theft cases. In 2007, there were over 7000 Fair Labor Standards Act (FLSA) suits filed in court. Only 151 of them were filed by the Department of Labor. If the Wage and Hour Division can’t get employers to pay workers, the Solicitor’s office must file suits in court to get the money back. Don Sherman of the Cincinnati Workers Center Don helped 11 workers file a wage claim against Masonry Structures, Inc based in Rogers, Arkansas in September 2007. These workers had helped the company build Wal-Mart stores in Iowa, Pennsylvania and Maryland. The workers had been offered $13 per hour, but were never paid. The workers and Don believe they are owed more than $15,000 from the company. In March 2008, a DOL Wage and Hour investigator in Arkansas informed Don that an agreement had been made with the owner of the company, David Crowell, to pay the wages back on a monthly installment plan. In June of 2008, after the workers complained about not receiving any money, the investigator informed the workers that the employer had reneged on paying and that the Department of Labor was considering whether or not to pursue the case in court. [Note 7] What’s the question? The workers didn’t get their money and they have put their trust in the Department of Labor. The case should be pursued. The Solicitor’s Office must assign or hire more attorneys to work on wage theft cases. If the investigators aggressively pursue wage theft cases, there must be staff and resources to file the cases in court if quick settlements don’t occur. Devote half the investigators’ time to targeted investigations. By 2007, the Wage and Hour Division was only devoting 23 percent of its resources to targeted inspections[Note 8], compared to 30 percent in 2000,[Note 9] 60 percent in 1968[Note 10] and more than half in 1941. Raising this percentage will be almost impossible to do without more enforcement staff for the Wage and Hour Division. The Secretary of Labor should fight for more staff over a six year time period and the percentage of investigators focused on investigations should increase from its current level to 50 percent of investigators’ time devoted to targeted investigations. Post information about wage robbers who owe workers more than $50,000 in back wages. Under the easy recommendations was the recommendation on posting recurring and willful violators, which seems imminently reasonable. It would also help workers to know even first time violators who steal substantial amounts of money. It would be another deterrent to wage theft if employers knew their crimes would be posted online in a searchable database. The website listing substantial and repeat wage violators should be updated regularly and allow easy access to information about employers who violate wage and hour laws. Those who molest children are placed on a predators list. Those who injure workers are posted on OSHA’s website. Those who steal a significant amount of wages or repeatedly steal from workers should be identified. In addition to serving as a strong deterrent to those who might steal wages, posting violators encourages workers who have had their wages stolen to complain themselves if they find that their employer has been found in violation in the past. Require employers to distribute settlement agreements to all their workers. Employers should be required to distribute their settlement agreements on labor issues, including back wages, to all their workers, so that workers understand what was agreed to and that their employer has had compliance problems. If problems continue and the workers complain again, the penalties could be (and should be) higher. For large cases, the settlement materials should automatically be posted online, such as is done for cases handled by the Federal Trade Commission (see www.ftc.gov) and the Securities and Exchange Commission (see www.sec.gov). Stop the Clock When Workers File Back Wage Cases. As was explained in the previous section, if a worker has had wages stolen, usually the Department of Labor will only collect wages for the last two years (in occasional “willful violation” situations the department will go back three years). Changing the statutory limit to have the clock stop when a worker files a case would mean workers would recover more of their stolen wages. It would be even better to add any additional wage theft that occurred since the complaint was filed to the two-year back-wage recovery. This would encourage employers to settle quickly. Target and train a team of joint Wage and Hour and OSHA investigators. There are some industries, like residential construction and meat packing, that are notorious for both their wage violations and their health and safety problems. These industries need joint investigations and people who are trained to spot both kinds of problems. Either, investigative teams could be created jointly by the two divisions, or new investigators could be hired and trained to spot both kinds of violations. In most European nations, labor inspectors are assigned to regions. The labor inspectors enforce all the laws. Gilberto worked at Genesis Fabrications from December 2007 through April 2008. He quit because of the low pay and terrible working conditions. He heard the Houston Interfaith Workers Center might be able to help him get all the wages he was owed. Gilberto claimed that none of the 15 to 20 workers were paid the minimum or overtime despite usually working approximately 72 hours per week. The owner’s excuse was that “the company is new and everyone needs to pitch in to make the company strong.” Gilberto was living at the factory and working as a security guard at night, receiving drop-off deliveries. His night duties were in exchange for not paying rent and not included in the 72 hours a week. Wage and Hour and OHSA should consolidate resources and jointly target industries that are known to both steal wages and injure workers. Targeting and training a team of inspectors is the first step in broader enforcement collaboration. Develop a One-Stop Approach for Enforcement. If you are a worker with a variety of problems at your workplace, here’s what happens: You might begin by calling the toll-free number on the minimum wage poster. Try it yourself—call 1-866-487-9243. This gets you to a person in a national call center who asks your zip code. Let’s say you claim you are having wage problems, health and safety problems and some discrimination problems. The person will then read a script about the laws pertaining to a few of the words you mention and then refer you to various government agencies. (The language on the scripts is legal gobbledygook—only comprehensible if you are totally familiar with the laws.) In this situation, you would be referred to the area Wage and Hour Division, area OSHA office, and the area Equal Employment Opportunities Commission (EEOC). The call center can give you all the numbers for the agencies and can transfer you directly to either Wage and Hour or OSHA. If you have several different types of problems, which is quite common, you have to file multiple complaints with multiple agencies. Brenda Vasquez came into the Workers Defense Project/Proyecto Defensa Laboral in 2005 complaining about sexual harassment at a chain restaurant with locations in Austin, Dallas and Houston. When the workers center volunteers began talking with her, they quickly realized she also had wage problems. She was encouraged to bring colleagues with her to the center. Eventually five workers filed a lawsuit seeking more than $25,000 in back wages. [Note 12] Had the woman only called EEOC, she would never have learned about the possibility of collecting the back wages. In the Fall of 2007, another worker visited the Workers Defense Project/Proyecto Defensa Laboral saying she had been raped by her manager. The workers center leaders helped her file a claim with the EEOC and the EEOC has filed a suit against the manager, but they also asked about wages. Sure enough—she too had been denied overtime. Other workers admitted that they too had been denied overtime. Together, the center is helping them recover more than $10,000 in back wages. [Note 13] Again, had the woman only called EEOC, it is doubtful that those wage issues would have gotten addressed. A one-stop approach would allow workers to get help with the variety of issues they face. The same employers who injure workers, steal wages. Those who harass workers, steal wages. Those who steal wages, injure and harass. If you have three different problems, you would need to meet with three different agencies, usually at three different locations. If you happened to be an immigrant without proper documentation, you probably couldn’t even get into the government offices. Multiple offices covering multiple jurisdictions does not serve the best interest of workers. The more holistic “one-stop” approach to problems that the 100-plus workers centers around the country use offers a better model for how the agency should serve workers. In most of the workers centers around the country, workers are invited to attended worker rights training sessions in which they learn about their rights in the workplace and get their most basic questions answered. Then the workers can meet with attorneys or worker rights advocates who review with them their problems and help them figure out how the problems can be addressed. The worker is always in control of decisions made about his or her situation. In 1998, Congress passed the Workforce Investment Act (WIA) that required states and communities to bring worker training and employment services under one roof. Ten years later, most of the one-stop centers have 13 of the 16 mandated programs participating. [Note 14] The Department of Labor rightly realized that it needed one-stops for worker training and employment service. Now it must recognize it needs “one-stops” for workplace problems. Initially, the agency should create ten pilot clinics at which Wage and Hour, OSHA, EEOC and state worker agencies all collaborate to assist workers with a variety of workplace problems. If workers routinely visit the center with pension problems, ERISA enforcement staff should be added. These clinics should be run collaboratively with workers centers and community organizations. The clinics should operate in the evenings and on Saturdays in order to best serve most employed workers. The clinics should not be located in downtown government buildings that intimidate immigrant workers[Note 15], but rather should operate in low-income and immigrant neighborhoods in institutions, such as churches, that are accessible and welcoming. Revamp and promote the backwages website. Years ago, out of conversations with Tammy McCutchen, the Wage and Hour Administrator from 2001 to 2004, Interfaith Worker Justice decided to create a backwages website in which workers who were owed wages collected by the Department of Labor and couldn’t be located could be listed. If workers don’t claim their backwages within a three-year time period, the monies revert to the U.S. Treasury. In order to create the searchable website of names, Interfaith Worker Justice sent a Freedom of Information (FOIA) request to the Wage and Hour Division. The Division denied the request claiming it would harm the privacy of these workers. Ridiculous. When we appealed the denial, we demonstrated that lots of other government agencies posted lists of people owed monies. Our appeal was denied. Finally, we sued the Department of Labor to get the names. Eventually, the Department of Labor agreed that it would create and post the website. Well, it technically did, but I’ll give you a dollar if you can find it on the DOL website in less than five minutes. It is carefully buried on the website and is not regularly publicized. [Note 16] In addition, it doesn’t allow you to easily locate friends or family members and send them the information. This back wages website should be revamped and promoted using the website created by the National Association of Unclaimed Property Administrators as the model. (By the way, in checking on the ease of use of that website for recommending in this book, I discovered that my dad, who passed away 15 years ago, has some unclaimed funds in Ohio. My sister and I are now tracking it down.) State labor agencies should be invited to join their back wages list with the national list in order to create one large searchable list of names of workers owed money from back wage settlements. Perhaps some of the private firms that have to locate workers for settlements would be interested in joining as well. Train private attorneys. The private bar is essential for helping enforce the nation’s labor laws. In 2007, there were 7,310 cases filed in federal court under the Fair Labor Standards Act. Only 151 of those cases were filed by the Department of Labor. [Note 17] Clearly, the private bar is carrying most of the burden before the courts. The Department of Labor staff could provide regular training to help the private bar understand the issues that must be addressed. The Wage and Hour Division should offer workshops and presentations at conferences sponsored by the National Employment Lawyers Association (NELA) and the AFL-CIO Lawyers Coordinating Committee. Clarify and Strengthen Employee Classification. As was discussed [earlier in Wage Theft in America], many employers steal wages from workers and revenues from taxing bodies by mis-classifying employees as independent contractors. Because there are so many different definitions used for defining who is an employee versus who is an independent contractor, the issue is confusing for everyone. The definitions need to be streamlined and enforcement strengthened. One bill introduced into Congress in 2008, the Employer Misclassification Prevention Act, introduced by Woolsey, Andrews and Miller, would clarify who is and is not an independent contractor, improve enforcement, and raise billions of dollars for the federal treasury and hard-pressed states, without raising taxes. [Note 18] It would also level the playing field for law-abiding employers who do right by their workers. Congress should ensure that workers have access to the wages and benefits, government insurance programs, and the employment rights they are due under existing law. Congress should promptly consider and enact this bill or similar legislation. Amend the Fair Labor Standards Act to allow opt-out versus opt-in class actions. In 1947 the Fair Labor Standards Act was amended to clarify that workers must “opt-in” for legal actions to recover their back wages. In most other kinds of workplace problems, groups of workers can join together and form a class for fixing problems that affect all of them. Despite the fact that stealing wages often affects large groups of workers, not just the handful that file complaints or file suits, the law requires workers to officially and publicly sign a piece of paper indicating that they would like to join a suit. There are several problems with this. First, it may be hard to find workers who may be covered by a suit but have moved. Low-wage workers move often. Second, given the level of fear workers have of being fired or retaliated against, many are reluctant about publicly adding their names to a suit. Third, those eligible for back-wages will be a smaller group rather than a larger group. If workers are having their wages stolen, why shouldn’t we make it as easy as possible to help the maximum number of workers possible recover stolen wages? And finally, making class actions lawsuits easier would be a stronger deterrent to employer wage theft. Support and work more strategically with state labor enforcement agencies. As was mentioned [earlier in Wage Theft in America], Frances Perkins viewed one of her most significant accomplishments as the work with state agencies. Today, the Department of Labor nationally provides very little support for state agencies. The two primary state associations, the National Association of Government Labor Officials (www.naglo.org) and the Interstate Labor Standards Association (www.ilsa.net) are poorly staffed and are not leading labor law enforcement efforts. In conversations with state labor staff, there are also problems when state agencies want to collaborate with the federal agencies. For example, according to Bob Anderson of the Wisconsin Equal Rights Division, if Wisconsin begins investigating a case and the federal Wage and Hour investigators want to look at the situation, Wisconsin will share its files and records. If the situation is reversed, the federal Wage and Hour investigators will not share files and records with the Wisconsin investigators. As he says, “The feds operate under The Privacy Act. Wisconsin operates under the Open Records Act.”[Note 19] There must be ways to encourage collaboration for the good of both workers and the general public. Despite the challenges of working together, some of the most creative and effective new wage enforcement approaches are being developed at the state level. The Wage and Hour Division should learn from these new approaches, facilitate sharing of best practices between states and build alliances to push for overall more effective mechanisms for protecting workers against wage theft. This will require a commitment of staff and resources to convene federal and staff enforcement staff and a willingness of senior Department of Labor leadership to lead the way in building collaborative strategic relationships. Increase the civil money penalties. Most of the previous recommendations, even the “heavy” ones that will require significant political capital such as dramatically increasing the enforcement staff, are not ones that should require significant amounts of national public debate and conversation. [Note 20] Some of the most important long-term policy changes needed to deter wage theft and raise the floor for workers will require significant discussion across party lines, between unions and business leaders, and with average Americans. These long-term policy recommendations are ones that reflect the changing nature of American society. How best can and should we as a nation establish wage policies that will deter and stop wage theft and raise the floor for all workers? These recommendations and ones like them from other forums should be talked about at dinner tables, discussed in public forums, fought about in editorials, and then we should come to some agreement as a society. The Secretary of Labor should write about such policies and help the nation begin the conversations. Business ethics groups could be asked to sponsor conferences to debate the policies that can effectively deter wage theft and raise the bar for all workers. The following recommendations are challenging. They will require long-term conversations with the public and Congress, which is why the conversations must be started as soon as possible. Improving the nation’s policies for protecting workers may take four years or eight years or longer. Whatever it takes will happen sooner if we begin now. Establish a penalty wage for nonpayment of wages within 15 days. The maritime industry has what’s called a seafarer’s penalty wage. At the end of a voyage after the cargo is unloaded or when a seafarer is discharged, the employer (called “the master” in the law) is required to pay the seafarer within four days. When payment isn’t made promptly, the employer has to pay the seafarer two day’s wage for each day the payment is delayed. Given the prevalence of workers not getting their final paychecks, establishing such a penalty wage for unscrupulous employers would help workers get paid. Because the penalties can become substantial fairly quickly, employers tend to pay the workers rather than risk paying the penalties. Let me give a quick example. Let’s assume a worker gets $10 per hour, usually 8 hours a day ($80 per day) and that the worker was let go and owed for 5 days of work ($400). The employer would be required to pay that $400 within 15 days. If the employer refused to pay, a penalty wage of $160 would be added for each day past 15 that the employer didn’t pay. So if after six weeks the employer still hadn’t paid, the worker would be owed the basic back wages ($400) plus a penalty of $160 x 30 ($4800). Require employers to pay the wage they promised. One of the major problems for workers, especially workers in low-wage jobs, is that employers don’t pay them the wages they were promised. Unless the employer doesn’t pay minimum wage or doesn’t pay overtime, the issue is not covered by the Fair Labor Standards Act and thus is not enforced by the Wage and Hour enforcement staff. Farmworkers have to be paid according to what they were promised (under another law), but there are not federal protections for most other workers. For most workers, their primary option is to file a suit against breach of contract. Because workers usually learn quickly that they are not going to get paid what they are promised, the total dollar amounts stolen are not enough to justify figuring out how to file a suit. Consequently, most workers have no recourse for not getting paid the wages they were promised. Employers should be required to pay workers for the wages they promised. This could be done by amending the Fair Labor Standards Act or passing another law requiring employers to put in writing the promised wages and then to pay them. Either way, it is an important to ensure that workers are paid all the wages they are promised. Not only should employers not steal, they shouldn’t lie either. Simplify and Expand the Coverage of the Fair Labor Standards Act (FLSA). [Earlier in Wage Theft in America] I described the many ways in which employers steal workers wages. For the Department of Labor’s Wage and Hour Division as well as for the advocates in workers centers, way too much time gets wasted on figuring out whether or not workers are covered by the Fair Labor Standards Act, rather than helping workers recover their wages. A worker visits the Houston Workers Center complaining of unpaid wages. The advocate then tries to find out what kind of business employs the worker in order to assess whether he or she is covered by the Fair labor Standards Act. Does the business do $500,000 worth of business? If so, the regulations assume that the business is involved in interstate commerce. Many workers don’t know the size of their employers’s business and unethical employers will deny (or hide) that their businesses does this much annual volume. Workers are also covered if they personally do activities associated with interstate commerce, such as processing a credit card or calling someone long distance. These complicated “interstate commerce” definitions are not helpful to low-wage workers and do not make common sense to the average American. If someone works for an employer, he or she should get paid the minimum wage and be protected by basic labor laws. The coverage requirements for the Occupational Safety and Health Act (OSHA) are simpler. OSHA covers all private sector workers who aren’t covered by other laws, like miners. The only exceptions are self-employed people, privately-employed domestic workers who work in the home of their employer, and family members on a family farm. The Fair Labor Standards Act would be a lot simpler if it had a comparable definition. Most of the states have passed minimum wage laws that are much simpler to figure out who is covered and who is not. Most states say, all workplaces with two workers or four workers are covered by the state minimum wage. This is much simpler for workers to figure out if they are covered than the complicated interstate commerce rules. The Fair Labor Standards Act could cover all workplaces with at least two employees. That would be much simpler to administer, saving investigators and advocates time for forcing compliance instead of figuring out if someone is covered. Given the billions of dollars in overtime wages stolen annually from workers, it would be helpful to explore again ways to simplify the overtime regulations. No matter how many times I have read the regulations, I still find them confusing. The complexity of the tests for who is exempt and who is not exempt from overtime makes it hard to educate workers and employers about the problems and difficult to enforce. Plus, it is hard to justify the exclusion of 30 different categories of workers from overtime primarily because the employers exercised the clout to get the workers excluded from overtime coverage. Consequently, all ideas for simplifying the overtime regulations and reducing those exempted from coverage should be debated and considered. Based on past experience, revising the overtime regulations is in itself a multi-year project. Even though colleagues who do policy work assure me there will be a huge uproar over simplifying definitions and expanding coverage somewhat, this seems like a political fight worth having. Are there really that many people who think any worker should work for less than minimum wage? Wouldn’t it be better for workers and employers to have an overtime law that we could all explain simply? Begin a National Conversation about a Uniform (Minimum) Labor Code. Because every state has different labor laws on a wide variety of topics and very few states do much outreach about the laws, the result is that most workers are clueless about many of their rights in the workplace. For businesses trying to operate in multiple states, making sure that the businesses are complying with such a wide variety of laws is both confusing and expensive. Thus, it is in businesses’, workers’ and the society-at-large’s interest to develop a uniform minimum labor code. Laws reflect our values. So what are the core values to which all of us (or at least most of us) can agree? What are the core minimums that should be adhered to in all workplaces? Please be assured that I am not trying to reduce standards for any worker. Any state that has significantly higher standards could and should keep them. Consequently, there will never be one standard code, but it would be helpful if there could be a uniform labor code that could become the working minimum that most in the society agree reflect our core values. Payday Periods. Thirty states have some sort of requirements around people getting paid either bi-weekly or semi-monthly. It seems like it wouldn’t be that difficult to get these agreed upon, nor that controversial to get them approved nationwide. Meal breaks and Rest Periods. About 28 states have laws requiring meal breaks or rest periods (the Fair Labor Standards Act does not require breaks, but governs when they must be paid.) Some states require a meal break if the employee works five consecutive hours, others states after six or seven hours. Would it really be so hard to pick one standard to apply nationwide? Breastfeeding. Most people would accept that women who are breastfeeding and need to pump milk should be allowed time to do this. 19 states have laws for this. Could we agree upon a uniform standard for this? Other examples include differing state laws on days of rest, reporting peiords, working split-shifts, working on Sundays, the Sabbath and holidays. There are several ways this could happen. The standards could become part of a revised Fair Labor Standards Act. They could become a new national bill. Or they could be adopted state-by-state. As complicated as this state-by-state approach sounds, similar approaches have occurred with such other topics. The National Association of Insurance Commissioners drafted Model Laws for the insurance industry, which have been adopted in part or in full in many states. The Uniform Commercial Code is a set of standardized state laws governing financial contracts. The code was drafted by the National Conference of State Law Commissioners, and was adopted in the 1950s by most states and the District of Columbia. [Note 24] Efforts are underway to create and get states to adopt a Uniform Building Code. Again, the uniform approach would not be the “maximum,” but a really bottom-line minimum core to which all could agree. Although I think there are basic employment standards to which we could all agree, I recognize that working through to this core minimum would take an extensive conversation. Perhaps if started now it could be agreed upon in two years, four years or even eight years. Whatever time frame is required, it will only be achieved if we start now. A task force could be developed that includes some national business leaders, some national union leaders and both federal and state labor agency people. Expand Core Standards Reflecting Our Values. As we mature as a nation, so too have our workplace standards developed and matured. For decades, children worked in sweatshops. The first bill to limit child labor, forbidding employment of minors under 14 for more than 10 hours per day, was passed in 1842. As low of a standard as this seems to us today, the law faced bitter opposition from employers when it first passed. [Note 25] It was decades longer before most adult workers got “only” a 10-hour day. Standards change over time as the society and working conditions develop. If we want to remain a great nation, we must continue to set minimum standards that reflect our values. What are the other minimum standards to which we should encourage the nation’s workplaces to strive? The Department of Labor should play a role in convening representatives of business, labor and religious communities to discuss what are the core standards that reflect our values in the 21st century. I appreciate that employers need some flexibility in managing the workforces, but workers also need the ability to manage their lives. It doesn’t seem that difficult to develop some national standards that would allow some flexibility for employers, while safeguarding workers’ lives. Should there be minimum vacation days? Most European companies have national standards for paid vacation days that are very generous. The U.S. requires no paid vacation days. Is there some minimum number of paid vacation days that wouldn’t be too onerous for businesses? 6 Is this not the fast which I choose, To loosen the bonds of wickedness, To undo the bands of the yoke, And to let the oppressed go free And break every yoke? 7 Is it not to divide your bread with the hungry And bring the homeless poor into the house; When you see the naked, to cover him; And not to hide yourself from your own flesh? 8 Then your light will break out like the dawn, And your recovery will speedily spring forth; And your righteousness will go before you; The glory of the LORD will be your rear guard. 11 And the LORD will continually guide you, And satisfy your desire in scorched places, And give strength to your bones; And you will be like a watered garden, And like a spring of water whose waters do not fail. 12 Those from among you will rebuild the ancient ruins; You will raise up the age-old foundations; And you will be called the repairer of the breach, The restorer of the streets in which to dwell. The Department of Labor’s mission resonates with this vision of Isaiah, but the leadership and its focus in recent years has waned. We all must help the Department of Labor to reclaim its mission and refocus its work on stopping wage theft and lifting the standards for the nation. Some of the changes needed the Department of Labor can be implement immediately. Others will require leadership to get the staffing resources and policies in place to strengthen wage theft enforcement. But while we are revamping the policies and building the institutional capacity to stop wage theft, we must begin building the national consensus on how to more effectively deter wage theft and put in place a floor for protecting the nation’s workers. These long-term conversations equip the nation and its workforce to expand and grow. Wage theft is a “breach” in the land. We can repair this breach. We can restore the payment of wages for workers. We can rebuild the Department of Labor so it is a protector of workers and a leader in setting workplace standards for all the nation’s workers. Doing so is not only the right thing to do for workers, it is good for America. Kim Bobo, founder and executive director of Interfaith Worker Justice, writes the Dispatches from the Workplace column for the online magazine Religion Dispatches. She is the author of Wage Theft in America: Why Millions of Working Americans Are Not Getting Paid—And What We Can Do About It (The New Press) and the co-author of Organizing for Social Change, the best-selling manual on progressive organizing in print. This article is based on the final chapter of her new book, and is republished here with permission from The New Press. 1.Both mission statements are from the division sections of the Department of Labor website. 2.The Wage and Hour Division does not have “granting” authority, but there is bound to be a way to make something like this happen if there is the will. 3.I’ve been told that there are many referrals in the child labor area, but that there is no data available. 4.National Institute for Literacy, “Fact Sheet: Adult and Family Literacy,” April, 2000. 5.Interview with Patrick Hickey, Director, Madison Workers Center, April 4, 2008. 6.Phone conversation with Don Sherman, Director of the Cincinnati Workers’ Center, on April 3, 2008 and follow-up e-mails on May 29, 2008. 7.Phone conversation with Don Sherman, Director of the Cincinnati Workers’ Center, on April 3, 2008 and follow-up emails on May 29, 2008. 8.Interfaith Worker Justice, Working on Faith: A Faithful Response to Worker Abuse in New Orleans, 2007. 9.USDOL, Wage and Hour Division, 1999-2000 Report on Initiatives, February 2001, page 11. 10.USDOL 1968 Budget Estimate, Volume II, 90th Congress, First Session, WH-14. 11.Interview with Laura Boston, worker advocate, Houston Interfaith Workers’ Center, May 15, 2008. 12.The suit filed actually asked for “double damages,” which means the amount of the back wages doubled or $50,000. Nonetheless the actual wages owed were more than $25,000. Inteview with Cristina Tzintzun, Coordinator for Workers Defense Project/Proyecto Defensa Laboral on May 7, 2008 and follow-up email on May 27, 2008. 13.The suit filed asks for double damages, or double the amount of the back wages owed. Interview with Cristina Tzintzun, Coordinator for Workers Defense Project/Proyecto Defensa Laboral on May 7, 2008 and follow-up email on May 27, 2008. 14.Government Accountability Office, One-Stop System Infrastructure Continues to Evolve, but Labor Should Take Action to Require That All Employment Service Offices are Part of the System (Washington, D.C.: Government Accountability Office, 2007). 15.Workers without proper government identification cannot even get admitted to many government buildings. The official DOL policy is to accept complaints from undocumented immigrants, but many of its office locations won’t let them in the buildings. 16.It is not sufficient to only publicize such a website when it first gets established. It most be publicized regularly. 17.James C. Duff, Judicial Business of the United States Courts, 2007 Annual Report of the Director, Administrative Office of the U.S. Courts, 2007. 18.Press Release, Committee on Education and Labor, U.S. House of Representatives, U.S. Reps. Andrews, Woolsey Introduce Bill to Stop Practice of Defining Workers Out of Their Workplace Rights, May 22, 2008. 19.Interview with Bob Anderson, Equal Rights Division, Wisconsin Department of Workforce Development, by phone on May 19, 2008. 20.Unfortunately, many policy advocates tell me that Washington, D.C. lobbyists can tie up agencies in debates over minutia, so I should not underestimate the fights that can be generated over widely accepted matters. 21.Interview with Fr. Sinclair Oubre, April 23, 2008. 22.Douglas B. Stevenson, Testimony before the House Subcommittee on Coast Guard and Maritime Transportation, June 20, 2006. 23.Minnesota Statute: 181.13 Penalty for Failure to Pay Wage Promptly. 24.Anwers.com, A website for business and finance definitions. Published by Answered Corporation. 25.John Upton Terrell, The United States Department of Labor: A story of workers, unions and the economy (New York: Meredith Press, 1968), 13. 26.Jerold Waltman, The Politics of the Minimum Wage (Chicago: University of Illinois Press, 2000) 32. 27.For more information about Paid Sick Days, visit the National Partnership for Women & Families. 28.For an excellent overview of the problems of excessive overtime, read Stopping the Clock: Controlling the Use of Mandatory Overtime in the Health Care Industry by the Federation of Nurses and Health Professionals. Copyright © 2008 by Kim Bobo. This excerpt originally appeared in Wage Theft in America: Why Millions of Working Americans Are Not Getting Paid—And What We Can Do About It. Published by The New Press. Reprinted here with permission.